Elvis comes to Menno Place! 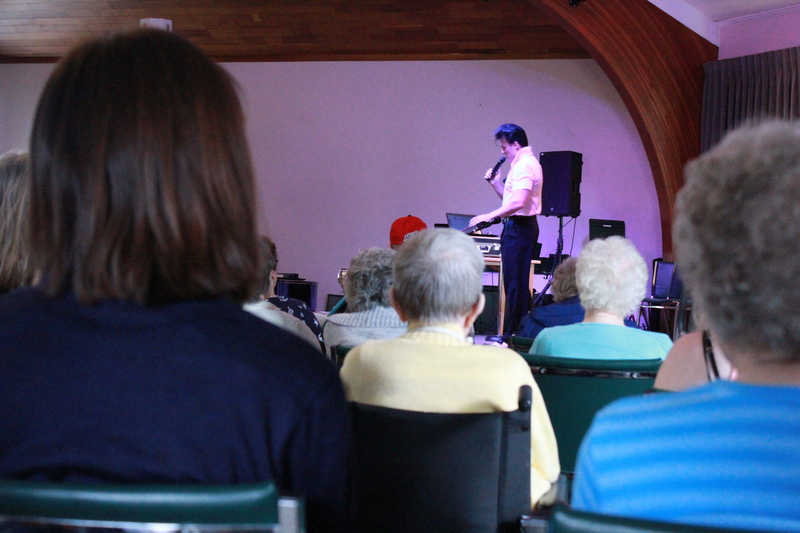 Elvis Presley, looking like he just stepped out of a time machine, took to the stage this afternoon at Menno Place to dazzle residents with old and familiar tunes. By the time I arrived the room was already jam-packed with residents from all over campus, and had begun to buzz with a quiet excitement for the concert that was about to begin. When the lights dimmed and Elvis started to sing every head turned, all eyes focused, and the magic began. For over an hour we were back in the 50’s, songs like Blue Hawaii, Crying in the Chapel and Love Me Tender took us back to the time of groovy gospel and rock’n’roll. Steve “Elvis” Elliott has been performing since 2004, and his experience as a musician was obvious. He sang flawlessly and with such energy; it was impossible to resist being swept away by the music. Taking every request – even to ‘Dance more!’ – Elvis jived his way into all our hearts this afternoon. Not only did he come to sing and dance, Elvis brought his ‘66 pink Cadillac for a photoshoot after the show! Events like this are common throughout the year at Menno Place, but this annual Elvis concert really marks the beginning of an exciting summer of events. Things like concerts, car shows and outdoor movie nights are planned and the whole campus comes together for moments of fun. More than just simple entertainment, these activities remind people of times past, help us to reminisce together, to reveal the beauty of small moments and shared experience. At this afternoon’s concert, as I tapped my foot in rhythm with the tune, I was reminded of the incredibly moving power of music. In my own life there are songs that instantly transport me back to my childhood, that bring up forgotten memories of joy and of heartache, and I wondered in that moment what memories were being brought up for all these people with so much more life experience than me? I looked around at people who had their eyes closed, small smiles on their faces, and wondered just what they were remembering as they listened to the melodies. How many beautiful moments are represented in this room? How many lost loves remembered, how many trials and triumphs brought to mind? This afternoon served as a reminder that everyone has a story, and that we are all brought a little closer together when we sing the same song.